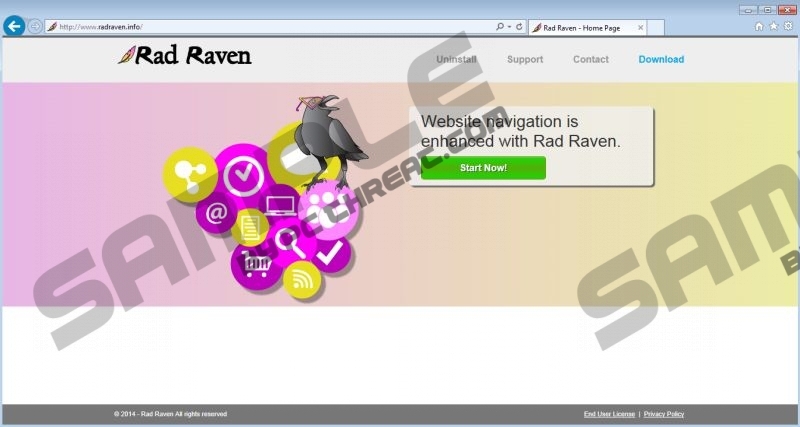 Rad Raven is an adware application that promises to make your web browsing better, but, in reality, questionably tracks your personal browsing and shows annoying commercial ads. That is all it does. How does that make browsing better? It doesn’t. In your place, we would remove Rad Raven immediately. Rad Raven works by setting itself up as a Mozilla Firefox and Internet Explorer extension, gathering private browsing data, including websites visited and links clicked on, to figure out what captures your interest. The more information about your likes and dislikes they have, the more attractive the ads that pop-up on your screen seem. As a general rule, you should never click these adverts, for they could lead you to a third-party website that contains dangerous malware downloaders. If the ads that are showed interest you too much to resist, get rid of this temptation by removing Rad Raven from your system. Like most people who make adware, Rad Raven developers, SuperWeb LLC, earn money through pay-per-click schemes. When you click an advert provided by this application, they get money for increasing traffic to that particular website. Basically, adware makes money from information you didn’t necessarily wanted to provide. This is not a good thing. Remove Rad Raven from your computer to protect your personal information. You could also get a trustworthy malware removal tool that will take care of adware as well as all threats that are much more dangerous by themselves. SuperWeb LLC needs a large quantity of people to click the ads provided by Rad Raven to make any money, so distribution is very important. Developers of this software mostly rely on bundling their programs with freeware programs. The most likely way to get it is when you breeze through to the Next button while installing some kind of free tool. If you found yourself with Rad Raven or similar programs after installing freeware, make sure you pay attention to the installation next time. Adware doesn’t get installed without at least theoretical approval by the user. If you pay attention, you will notice the option to refuse installing programs you don’t want. Don’t be afraid to cancel the installation. If you are bothered by the invasion of privacy, or companies making money from it, you should not hesitate to remove Rad Raven from your computer. We recommend doing it automatically, using a dependable anti-malware tool, like SpyHunter. If you insist on doing it manually, instructions are provided below. Find Rad Raven, click it. Quick & tested solution for Rad Raven removal.